At the Circus (1939) is one of the 1001 classic movies you should see. The photo shows from left: Groucho Marx; Charles Gemora in the gorilla suit; Harpo Marx; Florence Rice, and Chico Marx. Each Monday, I'm going to recommend a classic movie you should see (for the reasons behind the 1001 series and reviews of earlier films covered go here). The new film Kong: Skull Island (2017) has brought the monkey movie back into the spotlight, so with that in mind our March theme is Going Ape in Old Hollywood. 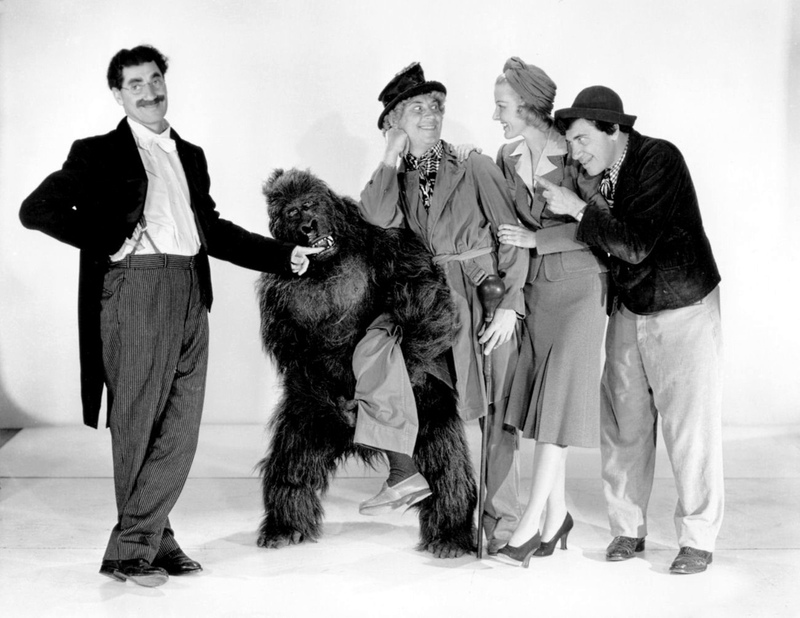 This week's selection is the Marx Brothers' comedy At the Circus (1939), which features a gorilla on the loose. At the Circus follows the adventures of Jeff Wilson (Kenny Baker), a wealthy young man who left his fortune behind to start the Wilson Wonder Circus. Jeff owes $10,000 to his shady partner (James Burke), but when the money is stolen, circus employee Antonio (Chico Marx) hires lawyer J. Cheever Loophole (Groucho Marx) to investigate. The result is typical Marx Brothers mayhem, especially when Loophole decides to romance Jeff's rich aunt (Margaret Dumont). At the Circus is the third film the Marx Brothers made for MGM. Studio executives briefly considered sending the trio to the world's fair before they settled on the big top for the now-familiar Marx movie formula of songs and romance mixed with the brother's unique brand of anarchic humor (silent film legend Buster Keaton worked as a gag man on the movie). The result is a fast and funny film that got mixed reviews from critics, but made money at the box office. Producer Mervyn LeRoy tried to get a real gorilla to play the circus ape, Gibraltar, but when that proved impossible, he rented an expensive monkey suit worn by stuntman and makeup artist Charles Gemora, who was known as "the King of the Gorilla Men" (dressing up in a monkey suit was a viable career option in thirties Hollywood). Gemora extensively studied real ape behavior, spending hours observing gorillas at the San Diego Zoo, and his efforts paid off with steady work in old Hollywood. In addition to At the Circus, Gemora played gorillas in Our Gang shorts, Laurel and Hardy movies, and Universal Pictures horror films. 1. Circus movies. It's hard to believe in light of recent news, but the circus used to be a beloved part of American life. This was reflected in the grand tradition of old Hollywood circus movies, which encompassed everything from animation (Dumbo) to film noir (Nightmare Alley). 2. Songs. The songwriting team of Harold Arlen and E.Y. Harburg wrote the songs for At the Circus when they weren't busy with another MGM project, The Wizard of Oz (1939). The results are a couple of pleasant songs warbled by Baker and Florence Rice and the unforgettable comic number, "Lydia, the Tattooed Lady," which became a signature number for Groucho Marx. 3. Margaret Dumont. The statuesque actress endured a lot during her 20 year association with the Marx Brothers, but she is really put through her paces in At the Circus. Ever the trouper, she gets shot out of a cannon, swings on the trapeze in nothing but her knickers, and is mauled by a man in a gorilla suit. 4. Eve Arden. The old Hollywood favorite has a memorable role as a scheming tightrope walker who catches Groucho's eye. Other critics: At the Circus has an 100 percent fresh rating at Rotten Tomatoes and Leonard Maltin calls the movie "not top-grade Marx Brothers, but some good scenes" in a two and 1\2 star review for his Classic Movie Guide. Critics in 1939 had mixed opinions of the movie. The Variety critic called At the Circus "broad, ribald fun" but The New York Times' Frank S. Nugent wrote, "in all charity and with a very real twinge of regret we must report that their new frolic is not exactly frolicsome; that it is, in cruel fact, a rather dispirited imitation of former Marx successes, a matter more of perspiration that inspiration and not at all up to the standards (foot-high though they may be) of daffy comedy." 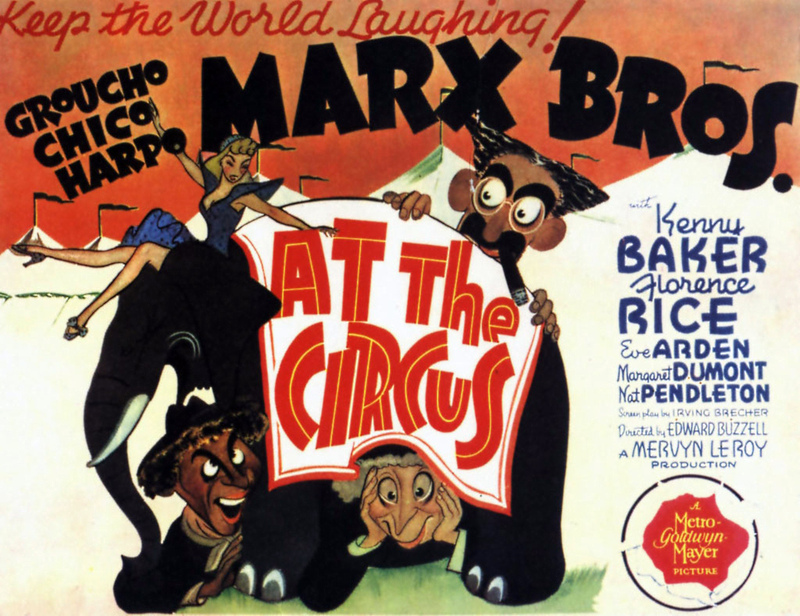 The bottom line: At the Circus lacks the surreal set pieces and pointed satire that make other Marx movies so outstanding, but it probably has the most belly laughs of any movie the brothers ever made. 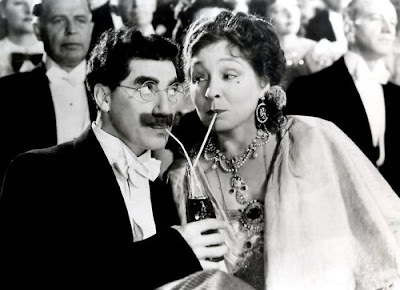 Watch it for "Lydia, the Tattooed Lady" and the hilarious interactions between Groucho and Dumont. Availability: TCM will air At the Circus at 6 a.m. June 5. It is also available on DVD and video on demand. Next week, I'll continue the March theme of Going Ape in Old Hollywood with Johnny Weissmuller as Tarzan the Ape Man (1932).